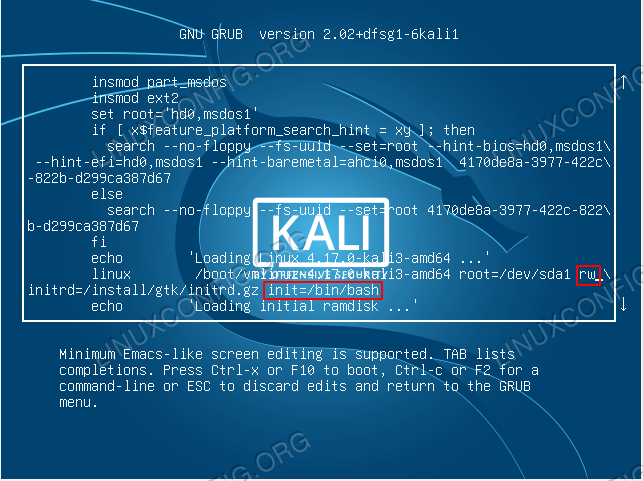 Reboot your Kali Linux system into the GRUB boot menu. Highlight the default boot menu you are usually booting from and press the e key in order to edit this boot menu entry. Once you entered the GRUB menu edit mode you will be presented with the following window. Scroll down until you hit the line starting with keyword linux. After you have located the appropriate boot entry as specified by the previous step, use navigational arrows to look for keyword ro and replace it with keyword rw. Next, on the same boot entry find keyword quiet and replace it with init=/bin/bash. Type mount command and look for / root mount partition. Confirm that this partition is mounted with rw permissions. At this point we are ready to reset the root user password. Type passwd command and enter your new password. Enter the root password again to verify. Press ENTER and confirm that the password reset was successful. Make sure that you removed splash boot option when editing grub's menu item.